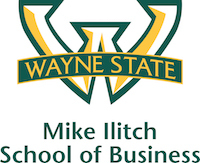 The Accounting Aid Society (AAS) recognized Myles Stern, chair of the Mike Ilitch School of Business accounting department, and accounting professor Deb Habel as 2017 Volunteer Income Tax Assistance (VITA) Champions. Additionally, the Detroit City Council presented Wayne State University with an Award of Recognition for being a collegiate sponsor of AAS. AAS provides free income tax and credit preparation and coaching for middle-to-low income households. For the past two years, AAS has held VITA training classes on the WSU campus. Stern said he is proud to have helped both facilitate the training sessions on campus and encourage Mike Ilitch School of Business students to become VITA volunteers. “The VITA program gives our students valuable experience and helps so many members of our local community,” he said. Habel said she was humbled to receive the recognition, and expressed admiration and gratitude for the AAS team. “Day in and day out they are serving seniors and the low-income population of southeastern Michigan, helping the bedrock of our community establish a solid footing,” she said. For more information about AAS, visit accountingaidsociety.org.